Benefit from innovative and intelligent case packing solutions. Folding cartons, tablet bottles, blisters, vials and inhalers - all pharma products are packed quickly and safely for shipment. From the GMP-compatible cantilever design and integrated Track & Trace solutions to our new Compact series in the case packing sector. Experience the innovative design and cutting-edge robot technology on a minimum footprint. Rely on efficient side loading technology. 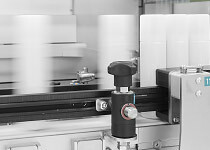 The world's first cantilever-style case packer offers you ultimate precision according to GMP standards. Trust in a our reliable machine performance with low life-cycle costs. Experience a modern, compact pharma design. Our new Compact series sets a new standard for the pharmaceutical production of the future. Innovative machine design, intelligent robot technology, and an operator-friendly machine combined with a small footprint are reason to trust our new compact series. Trust in our cutting-edge top loading technology for the lowest life-cycle costs. The integrated architecture of this GMP design is the pharma production of the future. Diverse infeed systems and the wide format range ensure freedom for new tasks and packaging solutions.